Rave: It’s so close to Christmas. I’m such a big fan of Christmas. I love the music, the food (ALL ABOUT THE FOOD), the festivities, the sparkle… Everything. I was wearing my ‘gateway’ Christmas jumper at the start of December. See, it’s not quite a Christmas jumper but it’s fairly festive. I think I can get away with wearing it in January as well. I do have a proper one that I’ll be rocking out soon. Rant: I hate myself (real hatred) for saying this but… Justin Bieber’s music is growing on me. WHAT’S GOING ON. I still detest the singer as I think he’s very arrogant and just not my type of person (as if we’d be friends otherwise;)) but his latest music is so bloody catchy. Rave: I don’t tend to spend lots of money… But when it comes to workout gear, I can’t seem to stop. I found these gorgeous pair of Lululemon capris on eBay the other week. Lululemon gear is just gorgeous but ridiculously priced. RIDICULOUSLY priced. Even worse than Sweaty Betty. I often have a little look on eBay to see if I can find anything and I was chuffed to score these for a discounted price. They are so soft, fit like a glove and just make me wish I was millionaire so I could buy everything from that shop. I also bought some (more) leggings from Fabletics in their Black Friday deal. Two pairs of leggings for the price of one, I couldn’t resist. I’d had these mesh capris in my ‘Wish’ bag already so I was happy to get them and another pair (more funky coloured) for the same price. I was concerned the mesh would be annoying but I barely notice it. Rants: Buying loads of new gym and running gear wasn’t a great idea just before I moved as it only meant packing more stuff. In the end clothes that were in drawers ended up in bin bags… which then ended up like this when I needed to find certain items. My running and gym gear has lovingly been put away now in my newly created chest of drawers. Though I still have a bin bag left of normal clothes I’ve yet to get to. Priorities. Rave: I’m really into snacking on biltong and dried meat at the moment. Such a good snack to tide you over until your next proper meal. Like meat crisps in a way 😉 Sorry veggies, I know that must sound awful to you. These high protein crisp snack things though didn’t blow me away… bit bland. I’ll stick to my Snack a Jacks I think. On the subject of my name. Before I got married I was Anna James, but then I took Ben’s second name (Smith) and made two boring names into an interesting one. Now my intention is to find my next husband and just keep adding to my name, like Anna Smith-James-Taylor, and so on. Obviously I’m joking. But I’m not changing my name. Who knows what the future holds but for now my name is remaining the same. The process of changing it is far too stressful… so many people, companies, websites to inform. Did you get anything on Black Friday? I can’t believe how quickly October is flying by! It’s almost Halloween – I thought that was ages away until I realised I had a Halloween party this weekend and didn’t have a costume… Anyway, here are my latest rants and raves. Rave: I forgot to mention in my post about my trip to Wales that I got ID’ed for entering one of the beer tents at the Food Festival!! This made my day. I’m only 27 so really this ins’t that big a feat but in my head I believe she thought I was under 18 😉 Bahaha! Rant: Since realising how close Halloween actually is I’ve just bought a costume for parkrun. I have no idea if I will be able to actually wear it to run in though and I’m thinking it will be too cold to stand and marshal in. *Sighs* Well it’ll do for the Halloween party anyway on Saturday night so it’s not a complete waste… I also bought a (very cheap) costume for Alfie as well. “Costume” sounds quite elaborate, but it’s really more of a jumper. If I can’t run and wear my outfit then Alfie will be coming to parkrun again and will be wearing his. He doesn’t know it yet 😉 I reeeeeaaaalllllly wanted this one but they didn’t do his small doggie size. Plus I’m pretty sure he’d pack his little bags and leave if I attempted to put him in that (but how cute, seriously??). Rave: These little chocolate cupcakes are so scrummy! I wish I’d bought more from the sweet shop in Wales. The salted caramel one was to die for. Rant: DNS’ing the same races I’ve DNS’ed for the past two years. How weird is that? I’ve now been injured at this point in the year three years in a row. It’s getting a little silly now. I wouldn’t have signed up so far in advance but these are really popular local (and cheap) races. Who was I to know Bournemouth would cause me such an issue? (Probably every other sensible runner in the world who suspected I was running too many marathons too close together…). I’m desperate to run the Gosport Half marathon (in a few weeks time) as it’s literally where my parents live and where I’ve done so many long runs before. It goes along the coast and has the view of the Isle of Wight, which is rather nice. But it seems this one, as with the Lordshill 10 mile this weekend, it’s not meant to be. Rave: I’ve entered the Chester marathon for next autumn. I know, I know. So far away but it was cheaper to enter now than to wait and I like having things down in the diary. I was tempted to do Bournemouth again as it was such a disaster for me this year, but marathons aren’t like 5ks or 10ks that can just do at a drop of a hat and I want to do lots of different ones rather than revisit the same ones. Chester was voted as the UK’s number one road marathon by Runners’ World in 2012 and 2013 so should be good. I can also time it nicely with a trip to Shropshire with my grandparents and parents (that also means more parkrun tourism, wheee!). Rave: I signed up to Tribe Pack to test out their snack boxes. The concept is like graze where you get a box of snacks delivered weekly/monthly/etc. and it’s a surprise what you get. The range of snacks include things like seeds, dried fruit, cereal/protein bars, etc. all made by Tribe. In a box you get two bars, two trail mixes, a ‘discover’ snack and a Tribe Life magazine. My box contained Tamari Seeds (sunflower, pumpkin, hulled hemp and chia seeds and tamari), Tumba trail mix (pumpkin seeds, almonds, organic goji, toasted coconut), Organic Mountain Berries (sour cherry, raisin, goldenberry, goji, aronia, barberry & wild blueberry) and a Baobab bar (superfruit energy bar) and a Wild Apricot, Pecan & Lucuma bar. Use the referral code TRIBE42383 which will get you a pack like I got for £1 (I would also get my next Tribe Pack for free). Rant: Still no running. I could go on and on (as you can imagine). I had an extremely deep and painful massage on Monday though which I’m still feeling the effects of so I really can’t judge. The person I saw said try in a week but I won’t unless it feels absolutely fine walking, which at the moment it (intermittently) doesn’t. Rave: I’m hoping to see Spectre tonight. And I have six free cinema tickets from my bank as part of the bonuses I get with my account. I foresee lots of film trips happening… I’m actually not a huge James Bond fan but the film does look good and I feel like I need to see it because I’ve seen so many of the others. Plus, Daniel Craig. And Nandos. Rave: When I was in Wales I bought myself a pack of four pastry forks. Basically they’re little forks with a sharp edge that you use to eat cake. As a regular cake eater I thought it would be nice to have the proper utensils to fully enjoy the experience. I’ll be keeping one in my handbag at all times of course. What are your rants and raves of late? James Bond: yes or no? Who was the best Bond? I like Daniel Craig. Less cheese but still a lot of smooth moves. Are you doing anything for Halloween? Any costumes? It’s no secret that I’m a bit of a popcorn addict. I pop my own salt and pepper popcorn and have as part of my lunch every day at work. My office initially thought I was bonkers but now they’ve come to accept my weird little obsession. Along with my more simple popcorn, I love trying the different flavours that have come out as well. There’s definitely been an explosion of popcorn in the past few years. No longer is it just the butter and sugar drenched stuff you buy to pop yourself and eat at home while watching a film or buy jumbo buckets of at the cinema. Recent flavours out there have also fully embraced the salty sweet flavour combo that is in full force at the moment too. It’s a match made in heaven in my eyes! Portlebay Popcorn do a range of popcorn flavours called Kracklecorn which is “hand popped” in Devon. Kracklecorn is where they’ve added raw cane sugar as the grains are popping which makes the popcorn more brittle and crunchy. They sent me a fabulous selection of popcorn flavours to test out and review. Honestly, I was blown away by the variety they had! I’ve previously tried the Crispy Bacon and Maple Syrup flavour and adored it so I knew that flavour would be fine. But Lemon Sherbet? Very Berry? That sounds mental! The three new flavours that Portlebay have released are Very Berry, Cinnamon Swirl and Lemon Sherbet. The Lemon Sherbet flavour was fairly subtle – don’t expect to get your head blown off. But it did have that tangy lemonness and fizziness you’d expect from the original sweet and it went so well with the popcorn. It tasted delicious!. It was my second favourite flavour (the maple bacon still has my heart). The Very Berry flavour was equally as subtle and extremely tasty. There were hints of berry-ness without it being overwhelming. The Cinnamon Swirl I was initially not sure about. It tasted very “American” if you know what I mean. It smelt quite synthetic. Cinnamon isn’t a huge flavour in the UK (unless it’s Christmas), unlike the US, and it reminded me of the sweet cinnamon things you can easily eat over there but not so much here. After a few bits I decided I did like it. Again, subtle flavours. The one flavour I wasn’t sure about was the Smoked Cheddar. Don’t get me wrong, it wasn’t awful but it was just odd. It had a cheesy flavour but was still slightly sweet. I don’t think I’d have this flavour again, but I wouldn’t throw it back at someone if they offered me some! I won’t go into the nutritional details for all the popcorn but I’ll give you an example. The range of calories per bag for the flavours is around 110-115 calories, so less than a packet of crisps and nice and filling with the fibre. The ingredients lists are also fairly clean without any nasty, strange sounding chemicals. They’re not vegan (they contain lactose) but they are gluten free. 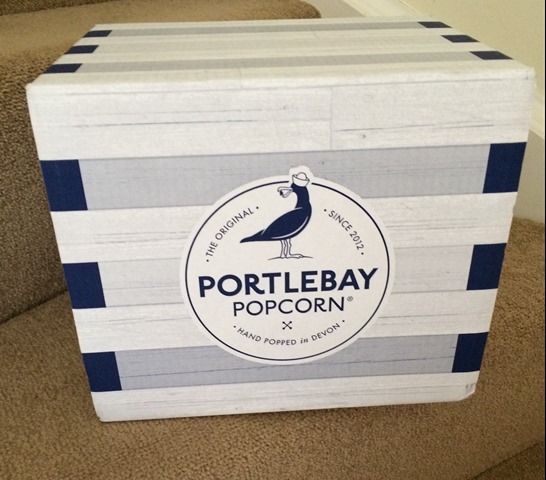 By far Portlebay are the best range of popcorn I’ve had. The crunchiness of the actual popcorn gives a nice eating experience (does that make sense?) and the flavours are really good. Big thumbs up from this popcorn addict! I just cannot buy bigger bags though as I won’t stop eating. What do you snack on when you’ve got the munchies? What’s the weirdest flavour you’ve tried (of anything! )?